Let’s talk about the honey lime drink pictured below for a second. It is freaking delicious! I typically buy myself one as a treat when I go to the Thursday market held at Srinakharinwirot University. The popup market is home to various vendors selling everything from clothing and toys to street food and produce. One of my favorite parts about the drink is the handy-dandy plastic handle. It allows me to easily carry my beverage and purchases at the same time. It’s been quite a few months since I shared Bits of Bangkok part 4, but I have compiled some new tidbits to share about how expat life in Bangkok is a wee-bit different than life in America. Children are provided with plastic plates, cutlery and cups in almost all restaurants. This is super handy and makes sharing meals with my toddler that much easier. Changing tables are nearly impossible to find, even in very kid friendly places. While this is no longer an issue for us since Jellybean is potty trained (wahoo!) it was really annoying when we first moved here. The lack of changing tables surprises me given what a baby/kid friendly country Thailand is. Pushcarts at the airports are free. There is no rummaging through your purse for change, jamming the coins into a slot and then trying to extract a pushcart like one has to do in the States. Sometimes it’s okay to round down when paying. For example, if your taxi ride comes to 41 baht a taxi driver will accept 40 baht. I never have felt comfortable with this and always round up, but rounding down is sometimes common practice. Some public restrooms you have to pay to use. This includes places like parks, markets and other tourist attractions. It’s usually only 2 baht, but if you don’t carry change on you it can be problematic as the toilet attendants don’t typically have the ability to break bills. Toilet paper is sparse in public restrooms. Usually you can deposit 5 baht into a dispenser for toilet paper, but ever once in a while there are no dispensers to be found, which can be hugely frustrating. Sorry for the potty theme, but as someone who’s constantly peeing (thanks pregnancy!) I’ve started to take note of where bathrooms are and their conditions … so yeah, last potty thing. Toilet paper is thrown into a small trash can next to the toilet instead of down the toilet. At most indoor playgrounds and play areas children take their shoes off to play. We keep socks in our bag just incase we unexpectedly stop someplace to play and Jellybean needs socks. She’s totally programmed to take off her shoes when we arrive places … it’s going to be a problem when we move back to the States. Need to pay you kid’s school tuition? How about your cable bill? Cash or bank transfer is the preferred way to pay any and all bills. We recently rented a jumpy house for Jellybean’s 3rd birthday party and the email confirmation included their bank’s name and account number. It was then left up to us if we transferred the money into their account or deposited the cash directly to their account. Thailand is definitely a cash based society, which is so different from the USA. 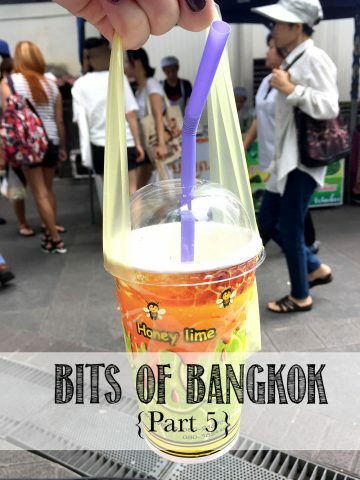 Incase you missed it, please check out the first, second, third and fourth installment of Bits of Bangkok. More of our Bangkok adventures, to date, can be found here or please follow along on Instagram.